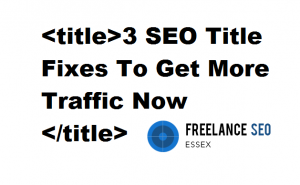 What Makes a Good SEO Title? There have been so many changes to the way search engines rank websites over the past decade it is hard even for us to keep up to date with every ranking factor. SEO methods that worked well for businesses a few years ago can now have a negative effect on a website, and there are new ranking factors appearing almost monthly. Google says that they use around 200 factors to determine where in search a page should rank, and they make approximately 400 changes every year – that’s a couple every working day! But, what does this have to do with crafting good titles? Well, the title metatag and H1 header have always been considered two of the most important factors for ranking a page. However, with so many changes in recent years, including Panda and keyword stuffing penalties as well as updates such as the so-called Pigeon and Hummingbird updates, which take into search locality and semantic signals, minor factors such as the words in a title or header seemed to take a back seat. At least, many SEOs started to fear over-optimisation of these signals and opted for a more natural language approach. However, a recent study by the team at Distilled has shown that meta titles and headers are still important, and optmisation can result in a boost in organic searches. According to an article by SEO reporter Barry Schwartz in Search Engine Land earlier this year, Google’s Andrey Lipattsev told the community what the most important factors are: RankBrain, links and content. So, what does this mean? Well, links are practically infamous in SEO in the post-Penguin world, and, largely misunderstood by many people. Anybody who works in SEO or has performed optimisation on their own website knows that links are still a leading ranking factor. A website without links (or with links that are considered low quality) will never rank as well as one with many good quality links. The big question for many people is, what sort of links work best and how do we get them? That is a topic for another discussion! We have already discussed RankBrain, and although little is properly understand, we do know that it affects around 3 in 20 searches made in Google (15%), which is a significant number. RankBrain is Google’s machine learning system, which is designed to change search results based on what it thinks people want to see. It is thought that user behaviour plays a part too, and this may include user experience (UX), so a website that provides a very clean and efficient journey for searchers may rank better. This of course ties in with mobile optimisation too, as this is where the whole industry is rapidly shifting towards. This leaves us with “content”. Now, Andrey Lipattsev did not specify what part of a website’s content is considered most important – it may be that by content, Google simply means everything that is displayed to users and Google on a page, so this may well include headers and titles, as these are the first pieces of content that most people actually read – titles in search and then headers on the page. It is not easy to put this into context, as we do not know how important the title and H1 elements are today. All we can do is take the time to optimise these as best we can by making changes and monitoring the effects to see if improvements are being made. Now to the nuts and bolts of this blog post – how to write great titles. A good title must achieve at least two things. First, it should engage readers. If a title is boring it will be overlooked and readers, or searchers, will click the next result, or the first one that catches their eye. But, a title also needs to appeal to Google – it needs to make sense and provide insights into what a page is about, i.e. it needs those all-important SEO keywords. One of the hardest tasks in SEO today is composing a title that perfectly ticks both the SEO and the UX boxes. But, before we go on to talk about titles and headers, we need to address another factor – should they be one and the same? As already mentioned, the title metatag is in the HTML of a webpage and Google will usually show it in the search results, and the H1, the first header, is the main visual heading on the page. Many content management systems, such as WordPress and Drupal, will create meta titles automatically based on the H1, so for many websites, they are the same. The big question is: Is this optimal? Or should we be crafting a metatag title for Google and search, and a separate heading for people to read? The jury is still out on this. For simplicity, we will follow the rule of one title for both purposes. Remember also that your title will appear if a page is linked in social media sites such as Facebook. Your most important keywords should ideally appear at the start of your title, and the title should not be any longer than 60 characters (although this may soon increase). A good title must be unique too. If your website has many pages on similar topics, or sell products that are almost identical, it is important not to use the same titles over and over. Make each one completely unique. The title needs to be relevant to the content. This may sound obvious, but all too often people create titles that are rather ambiguous in nature – sometimes is doesn’t pay to be too creative with words! It is important not to stuff all your important keywords into a title. Instead, pick one important keyword, or keyword phrase, to use. Including several search synonyms was a tactic that worked in the 1990s but is now a fast route to receiving a spam penalty. After your keyword/s, include the catchwords, i.e. words that attract attention. Catchwords encourage people to respond to a story by making them quickly question what the content is about on a subliminal level. Use words such as “secret”, “now”, “facts”, “how to” and “you”. Numbers also work well in titles – they help make a title stand out. For example, compare these two titles: “Metatag Title and Header Optimisation” and “3 SEO Title Fixes To Get More Traffic Now”. Which one do you think will attract more clicks? 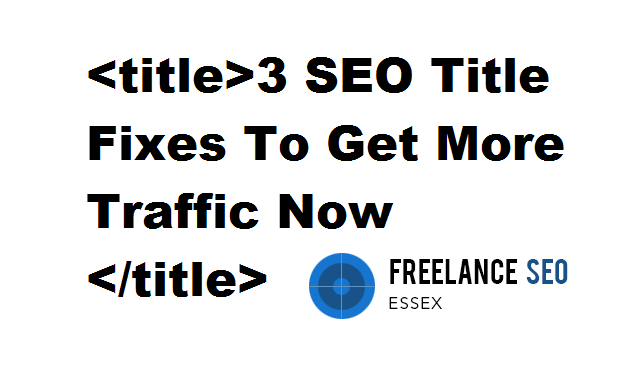 If you would like help with your SEO campaign, contact Freelance SEO Essex today.